A lady King … no, not a Queen. Somebody has crossed the water to be with us today. Catriona King, a dear friend from Belfast. So let’s give her a warm Bingergread Cottage welcome and get a hot drink into her to drive out the cold. Ooh, I would love a cup of tea. Milk but no sugar please. And a piece of cake would be fabulous. Whatever sort you have. Let’s start with your books – do you write under just one name or several? How many genres do you cover? How much have you had published including anthologies etc? 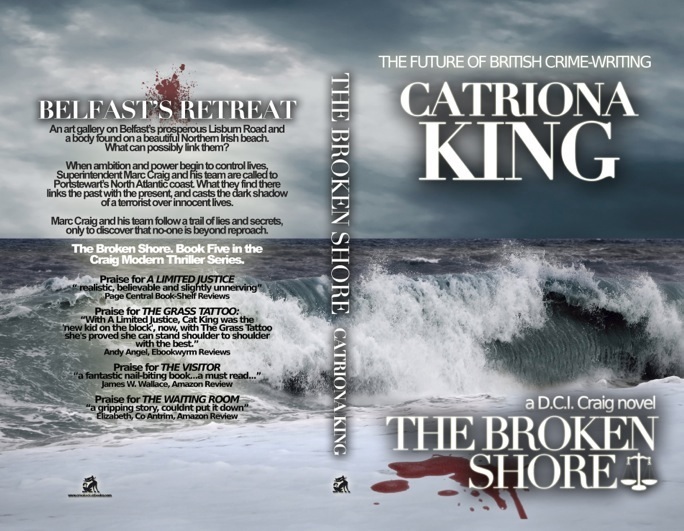 I write under my own name; Catriona King. I did think about using a pen-name but I thought people might wonder why. If I had done it would have been M.M. Flood, my late mother’s name, because we were very close. I write a series of crime novels called the Craig Thriller Series. Although they’re crime novels they often have romantic and comic back stories. My new book, ‘The Broken Shore’ is the fifth in the series. It’s due for release on the 13th December. I’ve also recently written a thriller set in New York that I hope will be out in 2014. It also has a strong love story running through it (as well as spies!). A play? How lovely! I would love to do that. How long have you been writing professionally? I imagine that, like all of us, you wrote all your life before “turning pro”. In my career I’ve written endless factual papers, book chapters and journalistic articles, and I’ve written fiction for my own enjoyment for years. My professional fiction writing career only started in 2012. That recently? Goodness! What was your first published work? Short story, magazine article, poem? It was my first novel, published in 2012. ‘A Limited Justice’, book one in the Craig Thriller Series. Crivens! First work a novel, like me! Gosh I knew we had a lot in common (giggle). What are your ambitions / hopes for your writing career? I’ve found that since I’ve been published I simply can’t stop writing! As soon as I complete a book and send it off to the publishers I have to fight with myself really hard to not start writing another. I’d love to write full time and, probably like most authors, that’s my ultimate ambition. I live in Belfast, Northern Ireland where I was born, but I only returned to live here in 2006 after years away living in London ( like Marc Craig, the main character in my books). I loved London for its variety and mix of people, but it was almost too big in ways. Belfast is very compact and has a lot to offer nowadays as a European City, particularly its burgeoning arts scene which is very exciting. I wouldn’t rule out living somewhere else in the world someday. Who knows? I also run a theatre group called ‘The Studio’ which is featured on my website with my books www.catrionakingbooks.com. A perfect day for me is having time to write, spending time with friends and then taking a rehearsal (I direct). Bliss! Yes. I trained as a doctor and also did an MBA (a business degree). I’ve held a variety of roles in the health service. Let’s get this straight, doctor, theatre director and writer … ahem …Outside of writing and any other work, what is your main passion (greatest pleasures?) I almost didn’t ask this! As mentioned earlier, the Arts generally are my great love, in particular the theatre. I love the classics and some amazing actors have performed here recently. Kenneth Branagh, Patrick O’Kane, Ciaran Hinds and Derek Jacobi have all been in the past couple of years. The theatre group is currently involved in a project with the RSC and the Lyric Theatre which is wonderful. Tell me two or three interesting facts about you that I haven’t asked. I can’t swim. Many people have tried to teach me but it hasn’t worked because I simply can’t put my head under the water. Three different psychics have told me it’s because I drowned in a previous life! I’m shy and really hate having my photograph taken. It is my least favourite thing in the whole world, even for work or in group shots. Perhaps part of me agrees with the belief that it steals your spirit? Ha ha. The desire to take ‘selfies’ (pictures of yourself) and post them on the internet is completely beyond me. Oh I know that – I hate having my photo taken too. So you sing? Great – come on and let’s have a bash at some Irish songs together while I pour some more tea and we put up your other important information. Chuck your bag over in the corner there while I get my bodhran out! Thanks for the insight, you two – what a great interview!